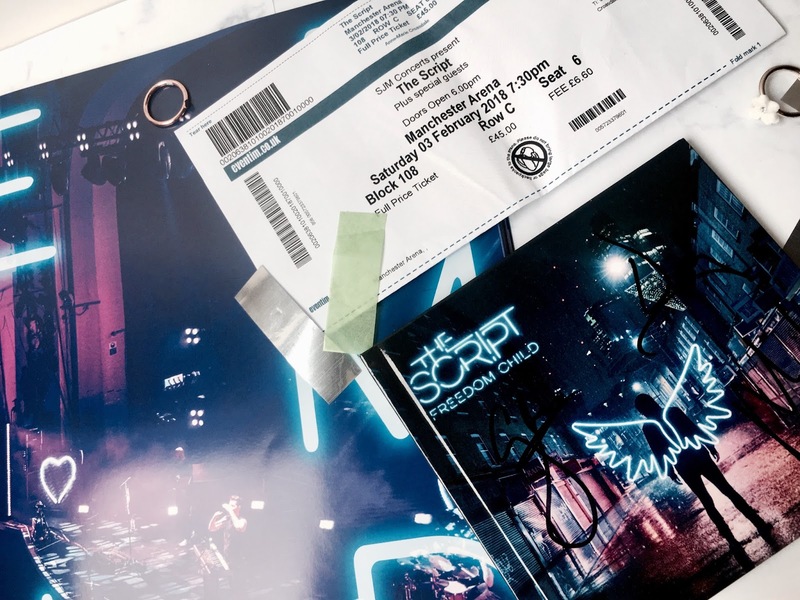 The Script are definitely one of the best live bands I have ever seen - I certainly had the time of my life last year when I went to see them at Blackpool, so of course when they announced an arena tour I jumped at the chance to go and see them again in Manchester, on the 3rd February. As usual for The Script's support acts, they were joined by someone I had actually heard of - Ella Eyre. I've liked some of her songs like Waiting All Night and Came Here For Love for ages so it was really fun to see them live. Support acts are definitely better when they sing a few songs you do actually know because that's what makes the crowd going, so it was really enjoyable. I was sat in Block 108, row C, which is the block right at the back of the arena, facing the stage. Although it's far back it provides a great straight-on view of the stage and is always a great view if the band have a B-Stage. Which, luckily The Script did! Just before they were due to come on, a huge curtain came down around the B-Stage, which made us think they must be starting the concert on the second stage. Otherwise, us lot in the back blocks wouldn't have been able to see the main stage! That they did, and they burst onto the B-Stage, beginning the set with Superheroes, the brilliant single off the fourth album, No Sound Without Silence. I had such a great view of them at this point and wished they would stay on that stage for the entire show. They continued to play some of their fast-paced songs that really get their crowd going, Rock The World and Paint The Town Green, before moving onto the main stage to play more of their classic back-catalogue. One of the songs that really stood out to me was The Man Who Can't Be Moved. It's a real oldie but a classic of The Script's, and I love how Danny gets the crowd to sing it before they join in with the instruments. The atmosphere feels really electric in the arena. Other favourites included Six Degrees Of Separation, If You Could See Me Now and new song No Man Is An Island. It's such a fun one to dance to! Another amazing moment was when Danny went out into the crowd. He was stood in the middle of block 103 and some very lucky fans got to choose the song he would play that hasn't been selected for this year's setlist already. Never Seen Anything Quite Like You was the choice, one of my personal favourites so it was really lovely. It's one that doesn't need a lot of production because it has the most beautiful melody so it was perfect to sing in the crowd. It was also so funny in Rain, the hit song off Freedom Child, a lot of the crowd put their umbrellas up in the air! They then went off before the encore which consisted of No Good In Goodbye, Breakeven and finally, Hall of Fame. I love the beginning of the encore of No Good In Goodbye because the guitar intro is absolutely insane. Breakeven is always a classic live, and although I think Hall Of Fame is getting a bit old now to finish on, when they brought the Manchester choir who appeared in One Love Manchester on was a really lovely touch. My only disappointment was that the title track of the new album, Freedom Child, wasn't on the setlist! The tour is called Freedom Child, it's only right to play that song when, since the album has been released, it has definitely become one of my all-time favourite songs from The Script already. Hopefully one day I'll hear it live! I absolutely love seeing The Script live again and I know I will definitely make sure to see them on their tours in the future too! They're definitely the sort of band you can see live again, and again. Have you been to any concerts lately, or got any lined up?